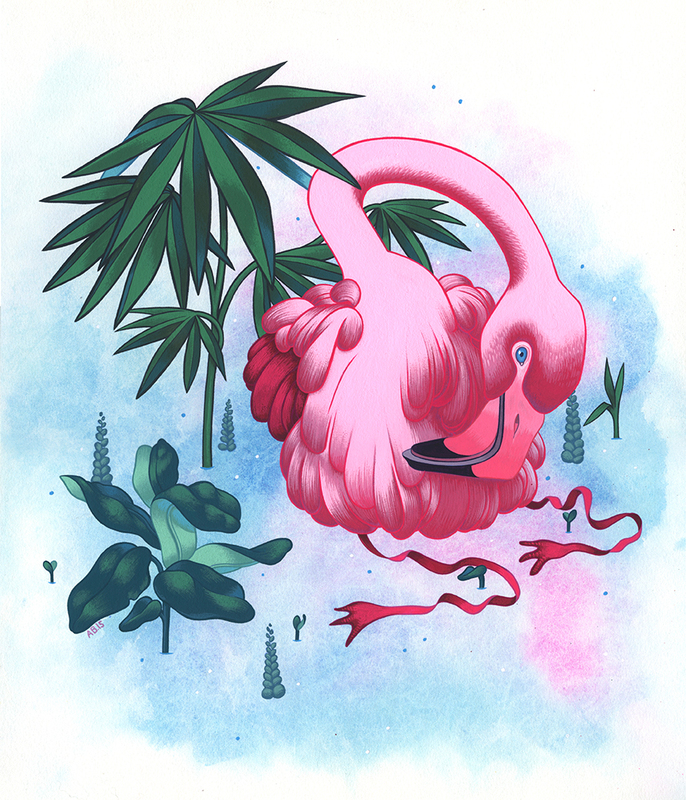 Allison Bamcat is a contemporary illustrator living in Boston, MA. Using a hyper-flat paint called acryla gouache, Bamcat renders lumpy props and characters suspended in a candy-coated universe, with sentient stuffed animals, botanicals, desserts, and ghosts navigating their way through stark landscapes. The fine craft of her paintings collides with her profession in fashion textile design, resulting in an array of bouncing conversational repeat prints in her range of custom-designed accessories, apparel, and soft goods. Her hand-sewn bags show her understanding of construction and surface design for a larger commercial audience, while her paintings tell a deeper story of her story as a female artist navigating mental illness. She resides outside of Boston, MA with her husband and two cats. Bamcat enjoys forensic TV shows and peanut butter ice cream.